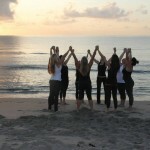 GetFit Retreats offers a wide variety of retreat packages and workshops customized to meet your needs and the need of your group. We take pride in making our retreats an experience that is custom and one-of-a-kind, distinct from anything else you have experienced. Below are some examples of retreat components that we incorporate. Mission Statement – To help others discover their inspiration by increasing their awareness of body, exploring their intention of mind, and awakening their creative spiritual self. GetFit Retreats is owned and founded by Monica McMahon, a certified personal trainer and fitness instructor with a successful business background, having specialized in human resources management for PepsiCo and leadership/organizational effectiveness for both small businesses and corporations. McMahon has a bachelor’s degree in psychology and organizational development from UC Berkeley with a Human Resources Management Certificate from UCLA. Monica’s passion lies in helping others recognize and use their strengths to achieve their goals of body, mind and spirit. The eclectic background of the GetFit Retreats Team allows for an enriching whole person approach to the retreats GetFit Retreats provides.